The HL2.0 collection represents the second generation of HAUTLENCE watches. After 4 years of development, it was first shown in 2010 and officially launched in its final version in 2011. Faithful to the brand’s fundamental concept of offering a different way of reading time, this collection goes even further and establishes HAUTLENCE among the most prestigious contemporary watchmaking brands. The HL2.0 models display half-trailing jumping hours - one of the special features of this second collection - retrograde minutes - a signature of the brand - and a power-reserve indicator. The collection also includes an automatic movement for the first time. Constructed around the retrograde minutes function, the jumping hours mechanism consists of a 12-link chain activated by a connecting-rod/crank as in the HL collection. The retrograde minutes are indicated on a 180° sector of the dial. An ingenious mechanism governs the movement of the assembly with a speed control that protects the components from any shocks arising from its operation. The chain rotates the mobile bridge through 60° each hour, compensating for the effect of gravity. To provide sufficient energy, the principal barrel, wound by the automatic system, winds a second barrel, which drives the display complication. Developed and produced by the Neuchâtel brand’s own teams, this collection is the first to offer a Manufacture mechanical movement with automatic winding. Two models are currently available, each limited to 28 numbered timepieces: the HL2.1 in 18-carat white gold and the HL2.2 in 18-carat 4N rose gold. The first patent concerns the half-trailing hours chain (as opposed to an instant system that is too fast to appreciate, or a dragging system that cannot be read correctly between the hours): every 60 minutes the chain advances in 3-4 seconds without jumps or loss of energy, making it possible to admire the beauty of the movement and its mechanisms in action. The second patent relates to the regulating organ integrated into the mobile bridge movement. Its constantly changing position, driven by the display, compensates statistically for the effect of gravity, enhancing its precision. The third patent covers the operation of the movement's two barrels. The principal barrel is wound by the automatic system and transmits the energy needed to wind a second barrel that is devoted exclusively to driving the complication. It is kept fully wound by the main barrel to ensure that an optimal level of energy is available to change each hour. This means the complex systems are powered independently without affecting the precision of the watch. 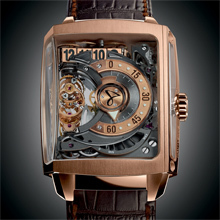 The mechanisms come to life simultaneously, powered by the energy in the complication barrel. The speed control that allows the chain links to advance the hours in 3-4 seconds begins to function and completes 48 revolutions at high speed (as opposed to instantly). The half-trailing hours display advances one revolution powered by the system's gear train. A coupler transmits the kinematics of the chain to the mobile bridge movement incorporating the regulating organ, which rotates through 60°. The kinematics of the full HL2.0 movement are structured in three dimensions by the use of special bevelled gears. These bevelled gears are produced with uniquely shaped tools to achieve optimal efficiency in gear-train transmission. 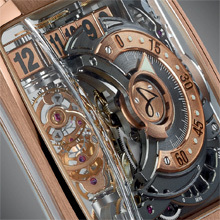 This timepiece also includes a power-reserve indicator as well as an oscillating weight in 18-carat gold. All numerals and indicators are luminescent to ensure excellent readability at night. HAUTLENCE HL2.0. HAUTLENCE in-house movement including gear train and automatic winding system. Half-trailing hours displayed by a chain, retrograde minutes, mobile bridge movement. Hours, retrograde minutes and power reserve. 2 barrels: one finishing barrel (power reserve for the entire watch movement including power for the second barrel) and a complication barrel. Hours displayed by a 12-link chain hinged on a pallet system. The speed regulator ensures that the hours display changes in 3-4 seconds instead of instantly. It completes 48 revolutions at each hour change. Hours system activated by a one-revolution mechanism composed principally of a connecting rod and rack. Mobile bridge movement comprises the regulating organ and rotates through 60° at each change of hour. Movement kinematics incorporate 90° changes of direction by means of special bevelled gears. Automatic movement with oscillating weight in 18-carat white gold. 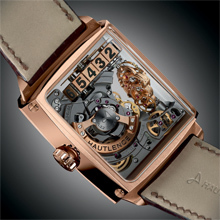 This innovative movement is protected by 3 HAUTLENCE patents. Finishing: fine-watchmaking type (satin-brushed, hand-drawn, hand-bevelled, ruthenium-anthracite coating and polished-blocked steel elements). Manufacturing technology: multi-axis micro-machining, wire electro-erosion. Crystal: 3 three-dimensional sapphire crystals, scratch-resistant, produced by multi-axis grinding. Alternating finishes: sand-blasting, satin-brushing and hand-polishing. Crown: 18-carat white gold with micro-machined HAUTLENCE logo. Horns: screwed, 18-carat white gold. Horn and case-back screws: 18-carat white gold. Ruthenium and rhodium-plated, black numerals and luminescent dots for readability in the dark. Hour numerals: rhodium-plated with luminescent numbers. Minutes hand: rhodium-plated with a luminescent tip for readability in the dark. Power-reserve hand: steel with luminescent indicator. Brown or black Louisiana alligator skin, large square scales, full wrapped, hand-stitched. Spring bar for changing the strap.